Accountability Challenge Week 52: The Courage to Change. Wow! We are now at week 52 of our 52-week Accountability challenge! It’s hard for me to believe. It has been a terrific journey. Special congratulations are in order for you if you have hung out with us for the whole year. If you haven’t made it through the entire 52-week journey that’s ok too. I thought the appropriate message to end this part of our journey (in truth I believe this is only a wonderful beginning) is the courage to change. It takes a tremendous amount of courage and strength (internally & externally) to follow through and achieve the goals and dreams that are most important to you. My hope is that I have armed you with an arsenal of tools from which to choose from to confidently go forward in the direction of your dreams. I know that many people have achieved some fantastic goals and dreams during the past 52 weeks. Having this is just the beginning. Each one of us is capable of so much more than we give ourselves credit for. Quite often the biggest roadblocks that we face in our personal journey toward excellence and life of significance are the fears that we hold in far too much esteem. Whether your goal is to complete a marathon, a triathlon, to cycle 200 km for charity, or to lose 40 pounds, the deciding factor in whether you are successful or not is usually when you make the decision to face your fears head on. I call it the courage to change. Making the necessary changes in our thoughts, feelings, and behaviours is not easy. In fact, it’s hard as hell at times. It takes a tremendous amount of courage and emotional strength. Over the past 52 weeks, one of the most important lessons that I have learned is that although change can be scary, it is a heck of a lot easier and more gratifying when we do it together. The achievement of any worthwhile goal takes the encouragement, support, and help of many different people, in many different forms. 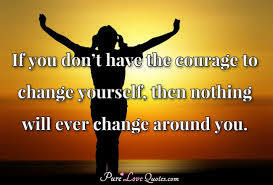 Moving forward from today, I know that my own courage to change is growing each and every day. “develop a friendly alliance with one or more persons who will encourage us to follow through with both our plan and purpose”. As you go forward in your own personal journey remember that you are not alone. I also want you to remember that if you continue to move forward, even if it is one small step at a time, you will arrive at your destination! In our next to last week together in our 52 Week Accountability Challenge I wanted to share with you the real power of accountability and support when used effectively. I call this the Power of the Performance Group. If you’ve stayed connected to us for the last 51 weeks, then you know how important the power of personal accountability is in achieving your goals and dreams. However, there is a real danger of playing it safe and remaining a spectator instead of committing “full on” and getting into the game. If you are honest, and you are human, then the probability is that you’ve done a bit of both, but not as much of the former as you would like. I know because I put myself in the “thinking about it” camp much more often than I would have liked. I am extremely proud of these accomplishments, as you should be of your own achievements and progress over the past year. However, when I look at some of my other “big, hairy, audacious goals” –particularly in my business-I have fallen short. Why is that? When I looked in the mirror, I realized that I was really only playing lip service to my own personal accountability to “do the work” that my business goals were asking me to do. Several weeks ago, I realized that if I was serious about making progress towards “these” goals (which I was!) something had to change-I had to change. I also recognized that I needed “help” to change. It was at this point that I made the decision to follow through on organizing my own Performance Group of like-minded individuals within the financial advice profession.This group would meet on a weekly basis, and we would commit in writing in the form of a weekly Performance Contract to commit completing a specific number of performance activities. These activities would move us toward our personal income/business related goals. It is important to emphasis that my commitment was to a specific targeted activity not a result. For example I committed to making 10 “prospecting” telephone calls four days during the business week. I had no control over the outcome of each call, but I could control whether or not I made the effort to pick up the telephone. We have now completed our second week as a Performance Group, and though it may be too early to judge the long term results, I can tell you with certainty that this has been by far the most effective performance enhancing tool that I have ever used. Let me repeat that, creating a Performance Group (there are currently three of us in the group) has been by far the most effective performance enhancing tool I have ever used! If you follow through in your commitment, and your weekly contracts, over a specified period of time, generally 8 -12 weeks, you will experience a Quantum Leap toward the achievement of your goals. . If you will quit the program at some point before completion, you will go back to square one. I admit that there was a tremendous amount of personal Resistance (otherwise known as the enemy within) on my part in organizing this performance group. After all, I had known about this concept (in theory) for ten years. My internal demons were doing their best to convince me otherwise: “you will never find a group of people who will commit to this type of thing”. “It’s too much work”, “but what will “they” think-“it won’t work” etc., etc. etc. Fortunately my own Powers of Persistence have grown strong enough over the past 51 weeks, for me to finally check my self-doubts and self-defeating behaviours at the door. I sincerely encourage you to do the same. All you need is two or three people who have goals that are similar to your own and who are open minded, and likeminded enough to recognized that it is ok to ask for help. It is in fact strength rather than a weakness. If you are serious about achieving the goals that are important to you, and to live the life of your dreams, you simply must take action on this concept. My challenge to you is to go out and create your own performance group. I’m here to help if you need it. I am extremely excited to share with you a performance enhancing tip that I know can make a huge impact towards the results that you achieve in your life. Like last’s week’s tip, on Performance Journaling, I learned this strategy from studying the work of Performance Psychologist Aaron Hemsley-who later passed the mantle to his outstandingly qualified daughter, Darci Hemsley-Brown. Although I have been known to resist it in my life, I have grown to realize and accept that when I create a more “structured” environment in my life, I get better results. This week’s strategy is about creating a weekly Performance Contract. Performance contracts increase the structure in our lives. When we have more structure in our lives we get better results. Performance contracts can and will produce a quantum leap in your productivity. 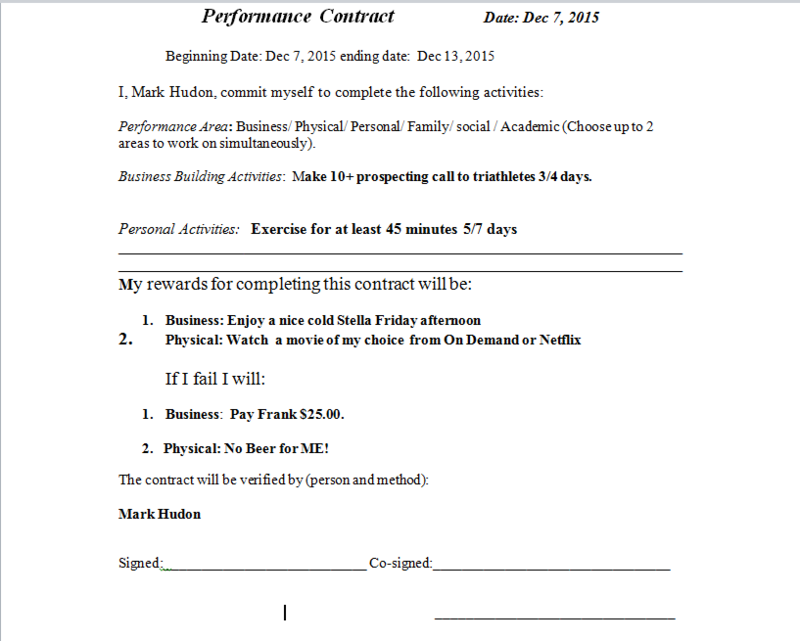 So what exactly is a Performance Contract? A Performance Contract is a written, with emphasis on the word written contract that you enter into whereby you commit to completing specific activities over a given time frame-usually over a one week period of time. When you complete the agreed upon activities you receive a reward, or positive reinforcement. If you do not complete the activities that you committed to, the reward is withheld, plus you must follow through with an unpleasant agreed upon consequence-punishment. Just like any other contract you sign it date it, and have someone else witness or sign it to verify the terms of the contract. Having a written performance contract specifies exactly what you must do in order to get the reward that you have pre-selected. It also tells you what you must do to avoid the “punishment” that you have also pre-selected. I can tell you from personal experience that a Performance Contract is one of the most powerful agents for behavioural change that you can possibly imagine. Contracts have to be in writing-no deviations, no exceptions, and no excuses. Verbal contracts are not, nor will they ever be effective change methods. Performance contracts work best when you focus on a maximum of two performance areas to improve. Work from a baseline. Start small and work your way up, step by step. Focus on Activities NOT Results. You cannot control the outcome, you can only control yourself and the activities that you commit to do. You may have a goal to lose 25 lbs. the only thing that we have direct control over whether we decide to exercise, or eat healthy on any given day. Positive Reinforcers (Rewards). A positive reinforcer is anything that will increase the occurrence of the behaviour that follows. Immediately after completing a performance activity give yourself a reward. Below you will find a sample Performance Contract that you can adapt to your particular goals. 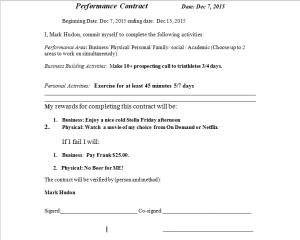 I have also included a copy of a Performance Contract that I used this past week to help me achieve my sales related activities & goals or my business. Having a written contract in place that I signed my name to, knowing that I was accountable to other people for its completion, and knowing that there would be both positive & negative consequence was an overwhelmingly positive motivator for me. Your view of my selected rewards & punishments may differ; just remember that each of us naturally moves toward pleasurable activities, and away from painful activities-. If you want to know a little but more about how to structure your own personal performance contract, and/or you want someone to help hold you accountable please drop me a line. I’m here to help, and this technique may just give you the breakthrough that you have been looking for. I mentioned last week that a huge key to improving your performance is to be able to control and reduce your level of “performance” anxiety. Taking time out of your day to practice deep breathing is essential to your long-term (I’d even go as far as to say lifetime) success. I’d like to share with you in this week’s lesson another extremely effective tool achieving better performance. It’s called Performance Journaling-it is another tool that is deceptively simple, but highly powerful. Whether we are aware of it or not, daily stresses from our lives and from the pursuit of our goals can deceptively build up until they actually inhibit our performance. If left untreated, or undetected, the way that we cope with these high levels of anxiety is to avoid or to reduce the amount of productive performance oriented behaviours that we undertake. This is actually a natural reaction to the situation we face. However, if our goal is in fact improved or increased levels of performance, than it is essential that we master all of the strategies for effective relaxation. Getting out a pen and pen, and physically writing for about 10-15 minutes about what you are doing, or not doing, and how you are feeling is called Performance Journaling. It is not a common strategy; in fact it may be one of the best kept secrets of high performance behaviourial management. I learned this technique about fifteen years ago from studying the work of Clinical Psychologist and performance behavioural expert, Dr. Aaron Hemsley, PHD. Dr. Hemsley completed over 40 years of research in the field of studying high performance athletes, and salespeople in the investment and insurance fields. He outlined the simple strategy of spending 10-15 minutes a day to write about what you what you were doing, how you were feeling, and what you learned from the experience of writing this down. The end result is that by performing this simple activity on a consistent basis, we were able to understand our internal areas of resistance and anxiety much better. When we go through this writing process we are able to reduce our present levels of anxiety until we reach what is known as the “performance range”. This is the area that we often referred to as being in “the zone”. When we are in the zone, we are able to effortlessly achieve peaks levels of performance. It is our natural state when we are in this range to want to perform more. We look forward to taking risks, we automatically move out of our comfort zone. We feel energized, light, motivated, and eager to perform. It becomes unnatural for us to not want to do otherwise. Truth be told, this strategy worked so well for me, that I stopped doing it. I experienced the increased levels in my own performance, until I reached a point of “comfort” where I felt that I didn’t need to do it any further. What I failed to realize until recently, was that left unchecked these old levels of performance anxiety had crept back into my own life, and had begun to seriously impede my own performance toward the achievement of my own goals and dreams. What I can tell you from my own experience is that performance journal writing is one of the most effective strategies for performance improvement that I have ever come across, and I am once again applying this strategy in my own life-This time the commitment is for life. So what exactly do you write about? The good news is that it doesn’t really matter what you write about, just that you do write. There are no rules, or protocols to follow. 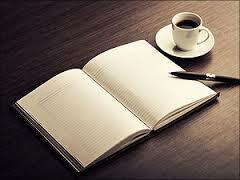 You write what you feel. What did I say I was going to do today towards my goal(s)? What did I actually do today? What did I learn by going through this exercise? What is the source of my anxiety? What is holding me back? What is it costing me to hold onto this anxiety or block? What will happen to me if I take action to overcome it, right now? These are just a few examples to get you started. The key is to write. To write often, to write when you feel anxious, and to write when you feel fine. Q What are my Goals and my PLAN for next week? Have you ever heard the expression that we need to slow down to speed up? Sometimes in the frenzied pursuit of our goals, we get so caught up in the tasks, the duties or the actions that we need to take, that we get overwhelmed. This often leads to ineffective or inefficient actions, and we actually begin to move further away from our goals, instead of moving closer to them. If this has ever happened to you, or someone you know, then the advice I have for you this week is to slow down. In the study of high performance athletics, it has been well documented that one of the core strategies for achieving maximum performance in any sport is for the athlete to be able to create a state of mental relaxation, prior to competition. This very same principle holds true for you and I in the pursuit of our important goals and dreams. When we are continually focused on “doing” instead of ‘being” we unknowingly build up a tremendous amount of internal stress and anxiety, both mental and physical. Without being aware of this happening, we take ourselves out of the peak performance state, and instead set ourselves up for failure. If you follow sports at all, you are probably familiar with the expression “he choked”, or “she choked”. Usually this refers to simple mistakes made by an athlete in the heat of competition. For example a golfer who blows a big lead at the end of a tournament, or misses a crucial, routine putt that he or she would normally make in their sleep. The reason this happens, is that whether they were consciously aware of it or not, the athlete’s internal level of anxiety, or stress rose to a level that made it impossible for them to perform as they desired. This happens to each of us all the time. The solution is so simple that it is often overlooked. The solution is to “relax” in the moment. We need to relax our bodies, and more importantly we need to relax our minds. The best way to do this is to….”breathe”.. That’s it we need to breathe more, breathe easier, breathe longer, and above all relax. Performance psychologists, tell us through their research that we can not achieve states of high performance, and hence our goals if we are overly anxious. Let’s practice putting ourselves in a relaxed state. Sit with your back straight in a comfortable chair. 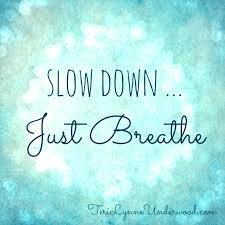 Release the breath with a slow exhale to a count of 8-10 seconds. Repeat this for a count of 10 breaths in and 10 breaths out. Repeat this process several times through out your day, particularly if you feel any anxiety, worry, nervousness or fear creep back into your state of mind. Repeating this simple, but often overlooked technique consistently, until it becomes a new positive habit is one of the best performance enhancing and goal achieving strategies available to us. Go ahead and do it now. Copyright 2019 Financially Fit For Life Mutual funds provided through FundEX Investments Inc.